An account in MoneyWell represents an account at your bank. The MoneyWell account transactions and balance should match your bank account. The exception would be any transactions that you have added to MoneyWell, but which have not yet cleared the bank. You can also create cash accounts, which represent the cash you have on hand rather than a bank account. Cash accounts let you track your cash purchases in the buckets. You can add a new account by clicking the + at the bottom under the Source list and selecting New Account. You can also use the File menu. You can add accounts manually or, if you have direct connect service from your bank, you can use that to add the account. When you add an account, you will be shown the New Account Guide. If you have Direct Connect Banking enabled for your account, MoneyWell can discover your accounts automatically. If you want to download transactions from your bank's website or manually enter them, you don't have to pick a financial institution. Just leave the "No Financial Institution" choice selected. To select your financial institution you can scroll through the list or type some part of the name to filter the list to a smaller subset, then follow the steps below. MoneyWell will download any available transactions from your bank. If there are transactions that are not available to be downloaded, MoneyWell will set an initial balance transaction to account for the older transactions. Click Continue without enter any username or password. Click the "Type" pop-up to change the type. Set the Balance and As Of values (see below for details). Set other account values (see the full list below). Type - The choices are checking account, savings account, credit card, loan/line of credit, investment account, cash account, and money market account. Name - This is the name you give to the account. It should be descriptive enough for you to identify the account. Balance - You can enter the initial bank balance. Pick the balance prior to any transaction activity you will be adding to MoneyWell. As Of - You can enter the date of the initial bank balance. This date should be the day before any other transactions in your account. Currency - Sets the default register currency for every transaction in that account. It also drives the currency formatting for the accounts list and reports. Memo - You can enter a note for informational purposes. Routing # - The routing number for your bank. Account # - The account number. 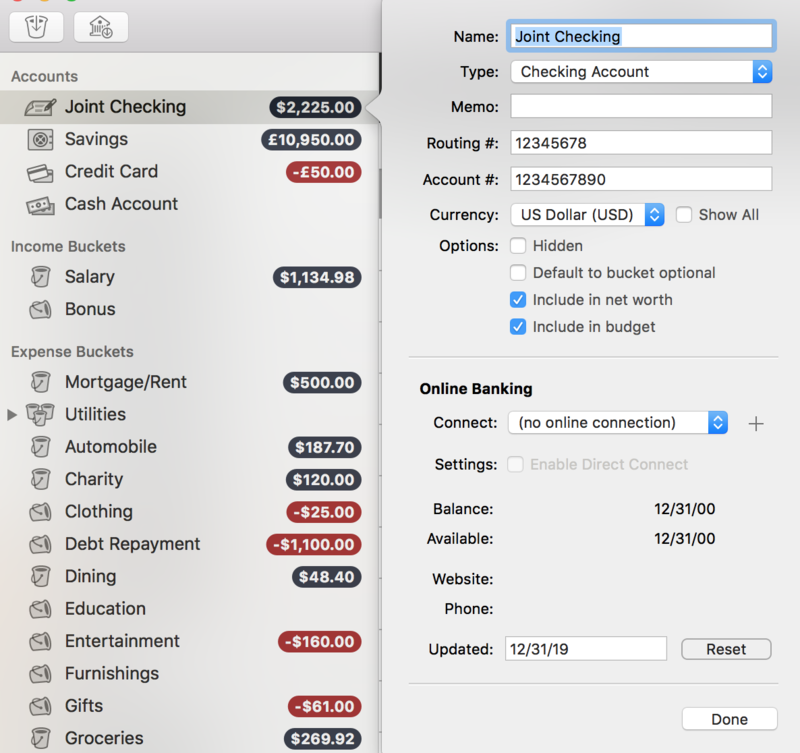 The "Routing #" and "Account #" values are only necessary if you are using direct connect banking or if you download QFX or OFX files from your bank's web site. To edit an existing account, double-click on the account in the Source list or right-click on the account and select Edit Account from the menu. Whether it's a new or existing account, you can change the settings in the Account info popover. Hidden - Toggle the visibility of an account in the Source list. Default to bucket optional - Set new transactions in this account to not require a bucket assignment. This is especially helpful for loan and investment accounts. Include in Net Worth - Include account on the Portfolio view and in net worth reporting. Include in Budget - Include the balance of this account when comparing accounts to the bucket balances. 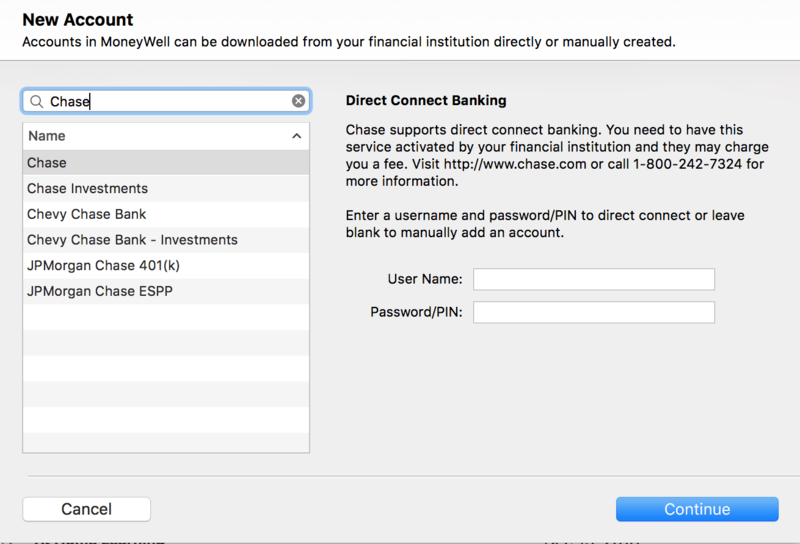 Online Banking - If your financial institution offers direct connect banking, MoneyWell will let you download your account information directly from it. The "Connect" pop-up is typically set when you add a new account, but you can set it manually here. The balance and connection information is filled in from the last successful connection. Updated - Normally, MoneyWell limits the range of transactions requested from the bank to only include transactions after the last successful download. Use the Reset button to tell MoneyWell to download all available information from your financial institution on the next connection. This can be useful if some past transactions were not downloaded from the bank. You can also directly set the date to limit the next connection. This date will be updated by the next successful connection.